If you want to experience a transformation, then you need some serious working skin care. I had the opportunity to review some exciting anti-aging products with the four product Time Rewind System from Dr. Loretta Skin Care that I know you will be eager to hear more about. Every product this leading Florida dermatologist created has proven science behind it for maximum performance, which intrigued me as I pulled out the Moisture Cleanse, Age Change Face, Age Change Eye, and Essential Boost that came in this tote bag. I started with the Vitamin B5 enriched Moisture Cleanse that also has chamomile and those amazing algae peptides that I love so much for what they can do to perk up a complexion. This was great for washing away dirt and makeup while rinsing off with water. My skin felt wonderfully hydrated without any greasy residue. The Age Change Face was my new day antioxidant moisturizer. This product has three different collagen peptides to help fill in fine lines and repair those wrinkles with cell regeneration properties that can carry deliver oxygen while also protecting from environmental toxins. I haven’t used this product very long, but I can say my skin is happy using it. This moisturizer is fast absorbing and already seems to be lightening a small mark I have. The Age Change Eye that I have been applying is protective with anti-aging benefits. This is another helpful eye gel with Tara Tree and antioxidant properties that felt soothing and managed de-puffing my allergy eyes in the morning. The last product that needed evaluating was the Essential Boost. I saved this serum for nights and must admit that even in the short span of my use that my complexion looks smoother and more glowing overall. As I stated, I only started using Dr. Loretta’s regime. But I have to admit that with every application I am witnessing a gradual improvement at a time. I look forward to continuing with this Time Rewind System since I am also confident with what I saw so far that it will please me to no ends by the time I finish with those four bottles! Do look into this new skin care line for yourself or to give Mom this Mother’s Day! 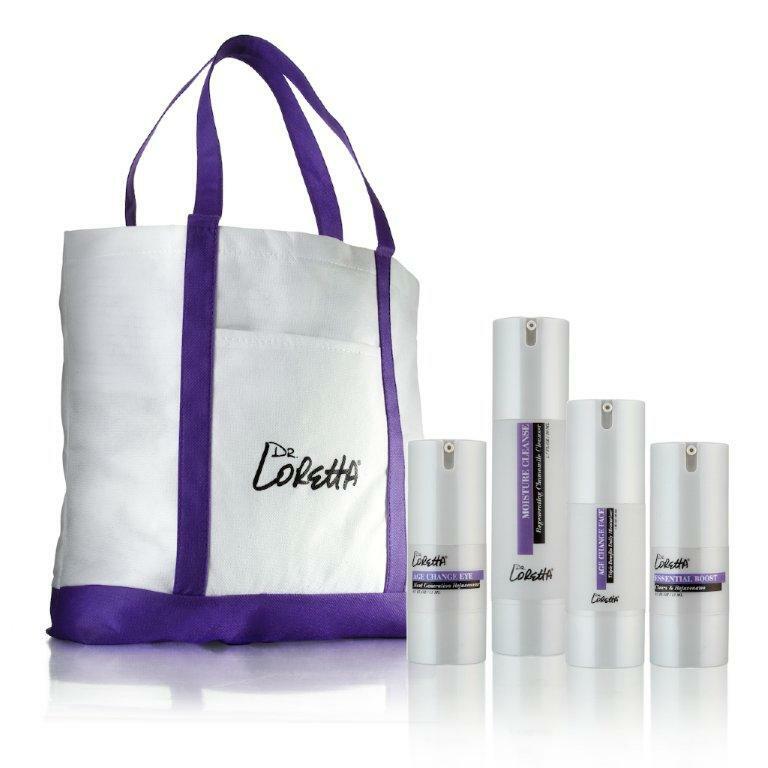 Thanks to Dr. Loretta Skin Care, two lucky Nuts 4 Stuff readers in the continental United States win the four product Time Rewind System plus tote bag ($110 value)! 2. Go to Dr. Loretta Skin Care and tell me something else you learned from their site in another comment. This giveaway ends May 22, 2012 at 12 PM Eastern Standard Time. The winner will need to respond to my email with name and shipping address within 48-hours or another winner will be picked. I learned that she is a practicing dermatologist! I follow on Google, the age face change is a best seller and one I would love to try. Dr. Loretta believes that products more than procedures are what maintain skin. I liked Nuts4Stuff on FB! ! I learned that if you have sensitive skin or rosacea you need the All’s Calm System ($78 Value, Now $39)which contains sulfate-free cleansing, topical Vitamin K, antioxidants and chemical-free SPF-30! I learned that Dr. Loretta 6 different serums. Yes, I'm following you at laurel4free@gmail.com "Laurel Klem"
I learned she's a board certified dermatologist and seems to care about the people buying her products on a one on one basis. Born in New York City, Dr. Loretta is a graduate of Hunter College of the City University of New York, Downstate Medical College of the State University of New York, and she did her dermatology residency at the Albert Einstein College of Medicine where she served as Chief Resident in Dermatology. I entered the elizabethW giveway. I love that she says that oily skin needs a moisturizer as well. Some people state the opposite, but in my experience they are wrong. 🙂 I have combination skin and although I get the typical shine in the center of my face, the areas under my cheekbones and around my mouth get very dry if I don't moisturize. The right mattifying cream is what works best for my skin. I entered the elizabethW Leaves and Magnolia Perfumes and Body Cream Sets Giveaway. I entered the Mally Beauty Shimmer, Shape & Glow Face Defining System Giveaway. I learned that Chamomile is not only soothing to the skin, but also good for aroma therapy! I follow on GFC (MizVickik) and would love to try the Face Erase cleanser. Thanks! GFC follower April V.april dot vrugtman at gmailDr. Loretta is a practicing dermatologist in Miami, FL. Melissa Morrismelmo626@gmail.comFollow you on Google Connect. Melissa MorrisVery impressive that Dr. Loretta stresses skin care and not procedures (which I'm sure costs much more)in order to keep your skin youthful and vibrant. Quite a change from the procedures that we are being inundated with! Melissa Morrismelmo626@gmail.comSubscribe to Nuts 4 Stuff by email. I learned that Dr. Loretta Skincare was founded in 1993. I learned that Dr. Loretta Skincare was founded in 1993 by board-certified dermatologist Loretta Ciraldo, MD, FAAD. I learned that Green Tea Extract contains a strong anti-inflammatory agent that helps to reduce skin inflammation and maintain your skin’s firm and elastic appearance. Sphingolipids are naturally occurring glycolipids. They are the layer of natural protective fats that cover a newborn baby’s skin. They are diminished by sun exposure and time, and by extensive exfoliation. I recommend replacing them with a product that contains lipids to keep your face feeling baby soft. I follow on GFC. AnnC. I learned Dr.Loretta is a dermotologist. I learned that glycolic acid is a very effective skin rejuvenator and works to exfoliate almost immediately.